A couple of weeks ago I was talking with a friend about helping out with a project related to this blog. During the conversation he asked me if I knew much about the worth of older comics. Specifically he has some Roy Thomas Conan comics from the 70s and he was wondering what they are worth. I told him I had no idea as I am not interested in the aftermarket, but that there are several price guide sites he could check out. On top of that I got an email from a friend pointing me to an online auction for Action comics #1 (the original not the one from three months ago). The buzz is that this is the copy owned by Nic Cage. As of my writing this the bid is up to $1,306,000.00. All this brings up memories of the speculator boom of the late 80s/early 90s. It’s the ghost of this boom that makes those unfamiliar think that any older comic book is worth something. The consensus is that the boom started in 1985 with the release of four titles. Batman: the Dark Knight Returns, Watchmen, Crisis on Infinite Earths and Secret Wars. All four titles were huge hits and together redefined comic books. They also gained a lot of mainstream attention. A lot of news stories at the time would always mention the worth of older comics like Action #1 or Detective comics #27. This prompted people to start collecting the successful books in hopes that they would gain worth over time. This led to other books at the time being collected in hopes that they too would gain worth. This was an interesting theory but had a huge flaw. The books from the 30s and 40s were valuable due to their rarity. A lot of comics were donated to paper drives during World War II. And let’s face it everyone has heard stories of parents tossing out the comics as trash. So a speculator market for books in the 80s was interesting but little should have come of it, except that the publishers started pandering to it. If you were into comics between 1985 and 1993 it was inescapable. Books were released with variant covers. There were covers with gimmicks like holograms, die-cut, embossing, and foil-stamps. Publishers would look for any excuse to launch a first issue. Back issues were selling like crazy. People were buying multiple copies of the same issue. Back then people in the comic book shop looked at me like I was crazy. I would buy one copy of an issue and then read it. Seriously I swear one guy nearly had a stroke once because I was ruining the resale value of the book by not immediately sealing it in a polybag. And yes there were speculators who were making money. And how were they doing that? They were selling to other speculators. Here you should see the first flaw in the paradigm. Who were those speculators going to sell to? Publishers were printing titles that were selling over a million copies an issue. Remember what I said about the rarity of the golden age books. That was not happening here. And if four titles launched the boom, it was two storylines that took it down. The Death of Superman and Knightfall. These stories saw Superman die and Batman crippled. Both were replaced by edgier successors. I and my fellow longtime comic fans were starting betting pools about how long it would take Clark Kent and Bruce Wayne to be restored and reclaim their mantles. However a lot of speculators were not longtime fans. They saw these books as real changing of the guards and bought them in unprecedented numbers. And this was the killing blow, not the inevitable return of the heroes, but the oversaturation from people ordering so much and the publisher meeting demand. Speculators would try to sell them off and couldn’t because their target audience already had plenty of copies of their own. And with that the speculator bubble went pop. It’s interesting to note that even though it was two DC stories that started the end of the boom DC does not get much of the blame. Most people heap much more blame on Marvel and Image as they were seen as the publishers that pandered the most to the speculators. As the comic speculation market was collapsing a new speculation market was being created. It was the trading card game market. Magic: The Gathering was designed to be collectible. But there was a major difference. Not once did Wizards of the Coast pander to the speculator market. When I was working at WotC customer service and a customer called in asking about card value we had a standard response. “Wizards of the Coast does not concern itself with the aftermarket and makes no decisions based on it”. And almost twenty years later there is still a healthy after market for Magic cards, with prices based on a cards value in tournament play more than anything. What about the comic book aftermarket today? It is still there, driven primarily by sites like EBay and Craigslist. Sadly you see some companies still trying to pander to it too. Go back and read my blog about the Flashpoint/Fear Itself controversy. What was Marvel offering for the destruction of DC books that were actually selling? A variant cover of Fear Itself. This entry was posted in Article and tagged Action Comics #1, comic books, DC comics, Magic: the Gathering, Marvel Comics, Speculation Market by Caliban. Bookmark the permalink. 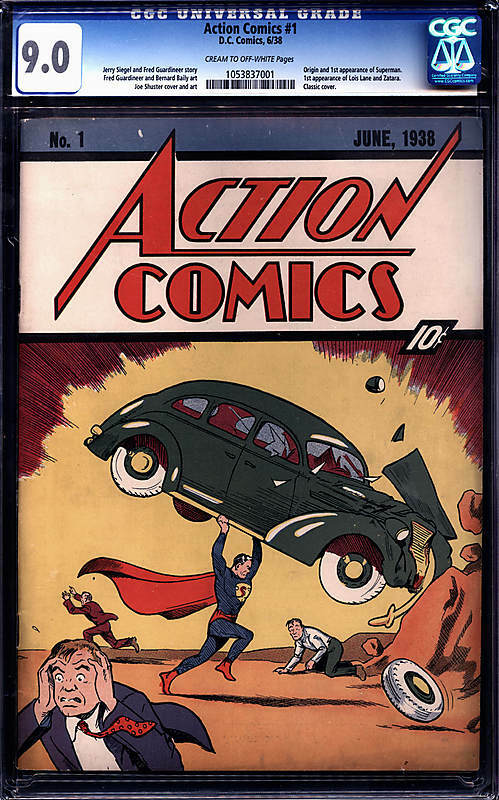 Another article supporting the idea that the Action Comics #1 belonged to Nic Cage:http://sciencefiction.com/2011/11/27/nick-cages-stolen-copy-of-action-comics-1-now-in-auction/Although, I do not see anything conclusive in it to verify that fact.On an unrelated note, I was interested that Blogspot embedded an ad for Deepok Chopra's Leela Kinect video game in this post . . .